Tips for backup important data at ASUS ZENFONE 2 LASER ZE500KL / ZE500KG / ZE550KL / ZE601KL / ZE550KG when we want to reformat or safe important data. Zenfone 2 Laser have 3 type with 5 or 5.5 or 6 inches LCD screen. The biggest screen size is Asus Zenfone 2 Laser ZE601KL which have 6 inches and have 3 GB RAM as well for multitasking. Minimum main camera resolutions is 8 megapixel and maximum 13 megapixel. After using several month we will have many important pictures or important data at ASUS ZENFONE 2 LASER, therefore we have to do backup before trouble happen like phone lost or corrupt. Almost all of us will have many contact or phonebook data at ASUS ZENFONE 2 LASER ZE500KL / ZE500KG / ZE550KL / ZE601KL / ZE550KG which are very important. We have to backup all important data at safety location. One important thing when we use Android that we can synchronize our contact data to Google account, what we have to do is make sure our phone already sign in with our personal Google account. After login to Gmail/Google account, the phone by default will automatically synchronize or backup our data to Google cloud server, so we will have 2 phonebooks storage, one is at our ASUS ZENFONE 2 LASER ZE500KL / ZE500KG / ZE550KL / ZE601KL / ZE550KG and the other one at https://contacts.google.com. Please check that address to make sure all data already backup at Google server. How to Backup Phone Book or Contact at ASUS ZENFONE 2 LASER ZE500KL / ZE500KG / ZE550KL / ZE601KL / ZE550KG Manually to SDCard Memory? Beside having backup at Google could for our contact, we can also backup or export our contact or phonebook at ASUS ZENFONE 2 LASER ZE500KL / ZE500KG / ZE550KL / ZE601KL / ZE550KG using Export menu at Contacts menu. How to Backup Picture/Photo ASUS ZENFONE 2 LASER ZE500KL / ZE500KG / ZE550KL / ZE601KL / ZE550KG ? Photo also important to backup because with good camera quality at ASUS ZENFONE 2 LASER ZE500KL / ZE500KG / ZE550KL / ZE601KL / ZE550KG, we will have many important pictures for special moment. There are some options to backup our media like Photo/pictures and videos to several location, hard-reset.org tips for easier step is backup our media to external microSD memory card. But for this step we need to prepare our MicroSD card first and insert it into memory card slot at our ASUS ZENFONE 2 LASER ZE500KL / ZE500KG / ZE550KL / ZE601KL / ZE550KG. 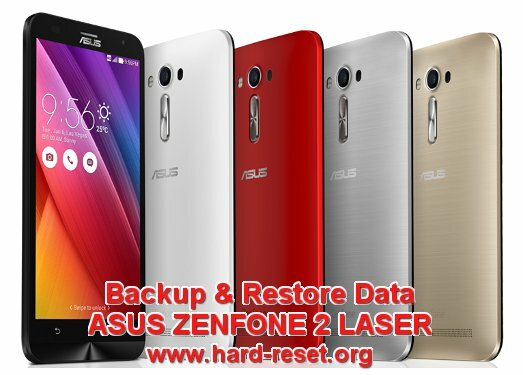 How to Backup and Restore Applications at ASUS ZENFONE 2 LASER ZE500KL / ZE500KG / ZE550KL / ZE601KL / ZE550KG before doing Hard Reset or Reformat ? After using several months, we will have some installed applications at our ASUS ZENFONE 2 LASER, the problem at Android is when we do hard reset or master format, all data and installed applications will be remove or wipe. After finish doing hard reset we will need to re-setup again our ASUS ZENFONE 2 LASER and install all applications one by one. Although this is not always happen, but sometime Google cloud backup will automatically restore our installed applications, but Google said that they not warranty all applications at the same Google account username will be restore to Android. Therefore, we have to use some tools to make sure this applications can back again normally, especially data and setting inside the applications. We can use Asus official applications to backup and restore installed applications at ASUS ZENFONE 2 LASER using Asus Backup applications from Google Play Store, this is free applications from Asus. Please remember, this applications will not backup any data inside our internal memory or external memory, please use steps above to backup data inside memory. This applications only backup installed applications and data also all Asus factory default applications setting like ZenUI Launcher, ZenUI Do it Later, ZenUI Contacts and ZenUI Messaging to external memory microSD. The information from this page describe about how to backuo asus zenfone laser 2,to to create data backup in my asus zenfone laser 2. If you need another resource for hard reset, use search function at this homepage or find from our related posts. Easy Way to Backup & Restore LENOVO LEMON 3 Contact, SMS, Data, Picture Before Doing Hard Reset Format?